Paris 17th district. A self catering 1 Bedroom. Renovated and well equiped. Rare in central Paris: very quiet and bright 38m² apartment with 1 bedroom and 1 living room completly renovated. Located on the 7th and last floor (with lift to the 6th floor). Air conditioning available. 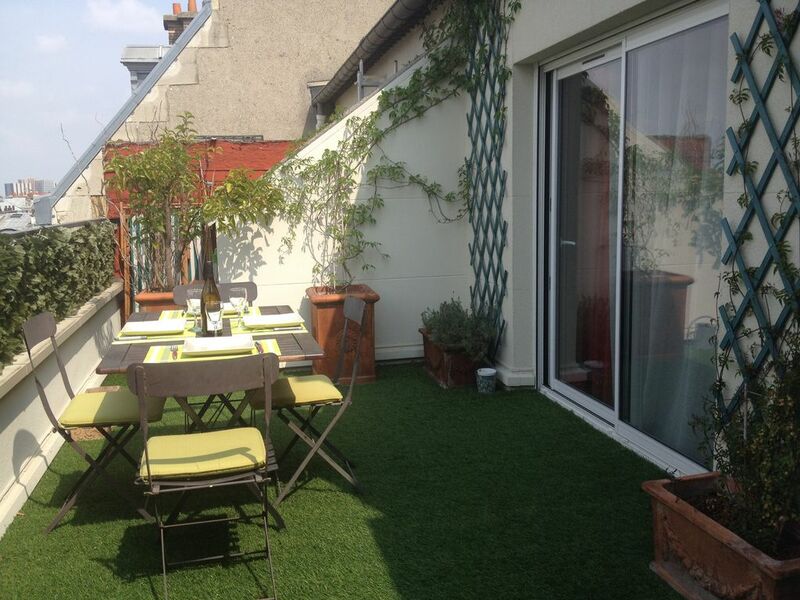 Large west facing terrace (18m2) overlooking the roof tops of Paris. Ideal for romantic diners (no vis a vis). 1 queen size bed 160 cm) in bedroom for 2. Large TV screen, free internet access. Kitchen and Bathroom (with bath) fully equipped. Easy acces by metro or bus (to main tourist sites (Montmartre, Opera, Grands Magasins, Louvre, also to major business centers as La Defense or Le Parc des Expositions de Villepinte). Plenty of restaurants and nice food stores in the neighbourhood (rue des Moines, rue Lemercier). Close to the famous open market 'Marché des Batignolles' and the charming Square des Batignolles. A large and secluded terrace for diner and relaxing after a long day visiting Paris. Possibility to rent a parking lot nearby. All rooms have wooden floor and are nicely decorated. Large TV handset. Kitchen fully equipped. Very sunny apartment. The apartment is located in a very quite street. Apartment with roof terrace in center Paris. The apartment is in a lively area with restaurants and typical French street market. Montmartre and large departments stores (Printemps and Galeries Lafayette) only 15 minutes by Metro. Charles De Gaulle CDG Airport at 28 minutes (30 km) and Saint Lazare railway station to Versailles castle only 10 mns. Champs Elysées and le Louvre museum at 20 minutes.